I turn to another Michael Pisaro composition, the third written about here in as many months. Like its two predecessors, the 2007 composition a wave and waves is intimate and interdependent with a particular poem by a great poet- July Mountain rooted in what turned out to be Wallace Stevens' final poem; black, white, red, green, blue/(voyelles) derived from Rimbaud's luminous verse; and now the analogous poem for Pisaro's concern with confounding the small and the large , Ashbery's 21 page stream-of-consciousness, alternately rueful and surrealy comic unfurling of memory, A Wave. A wave and waves bears a few other similarities to the aforementioned Pisaro works; all three pieces are realized via Pisaro's partnership with instrumentalists [guitarist Barry Chabala on black, white, red, green, blue, percussionist Greg Stuart on July Mountain and a wave...] who seem to meet his ideas and intentions with the sort of simpatico, intuitive musicianship heard in the strongest encounters between improvising musicians; both July Mountain and a wave... are sound worlds in which Pisaro doesn't privilege one instrument/sound source over another, so that a vibraphone is co-equal with grains of rice, or airplane drones and sine waves meld in the ear; in Chabala's evocative guitar work on black..., to continue the inventory of Pisaro's non-duality in musical matters, notes and silence share space without preponderance; and, more difficult to articulate with specific pointers, all three releases are musical manifestations of the idea that the whole of a thing being considered [or with Pisaro's results musically, considered and enjoyed] can best be grasped by attention to the myriad details assembled giving that whole its force, vitality and, well, largeness. Pisaro loves working with small details on a large scale, creating gentle but unmistakable momentum from meticulous, granular sounds. From my perspective, Pisaro sits on an ongoing list of creative individuals whose ideas and sensibilities I call buddhist-without-being-buddhist- or, in some examples, more-buddhist-than-avowed-buddhists. This is, obviously, a personal and extra-dimension, but I find the basic approach of Pisaro to have a great affinity with some aspects of buddhist [and Taoist] philosophy. So breaking thoughts and feelings down into molecules of sound, as Ashbery does in verse form, Pisaro's waves, pulses and striations of sound carry forward in two 35 minute blocks, each prefaced by a minute of silence, and separated by four minutes of silence. 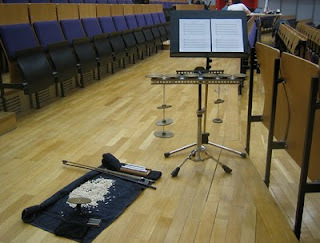 The sound, in this realization, is 100 waves of percussion, the sources for the sound waves selected and assembled by Stuart, with a self-evident regard and care for each [yes, each and every] one of the one hundred percussion events; the percussive characteristics, timbral qualities and integrity of Stuart's choices are remarkable. The waves are of strict duration, composed so as they overlap and swell into endless patterns and crescendos. Like Ashbery's cascading poem, the waves are contemplative, but never without the detritus of a life lived. Like Ashbery too, small events, epiphanies and recurrences surge forth, overlapping and cresting, no beginning, no terminus point. It takes time for this sort of assemblage to flow, so Ashbery takes his sweet, 21 pages of time; Pisaro's consideration for the listener is manifest in the four minute breather between the first wave [100 consecutive 20- second sections], and the second waves [entitled a haven of security and unreachable]. Like the overall effect of July Mountain [as well as that of the stunning four volume series, Transparent City], a wave sounds almost free of the complex, precisely scored conceptual thought Pisaro brings to every new work. At the risk of merely reiterating the observations I articulated in the July Mountain review, this is the great pleasure I take in Pisaro's work. He creates living, breathing worlds that sound organic, effortless, and unsullied by the heavy hand of a composer. I'd hazard a guess that Cage would never feel pushed by Pisaro's compositions, for all their elaborate crafting and [Stevens, Rimbaud, Ashbery, zen] difficult sources and origination. Stuart, in like-minded collaboration with Pisaro, has created 70 minutes of 100 percussion events with nary an explicit sound of a drum stick stroke. If you come away from this review without curiosity as to how a large scale work for 100 percussionists/or 100 over-dubbed percussion parts can be so liquid, more wave than solidity, I have let you down. Pisaro and Stuart are mapping a sound world of great clarity, even luminosity, joining complex scores and a radical attunement to the most elemental music possible- mountains, waves, cities, even, in an early Pisaro work [mind is moving], thought itself. But there are no fractions, writes Ashbery, the world is an integer, like us. I continue to delight in how Pisaro and his amazing collaborators throw it together, pitches and patches, waves and silence. a wave and waves was released in 2010 on the Cathnor imprint, in a lovely, challenging -to-shelve, edition; with pith notes by both Pisaro and Stuart, and sharp design/graphics by the enigmatic Olaf Oxleay, and Pisaro. 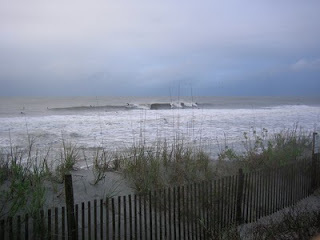 Photos of Folly Beach and some of Stuart's instruments for awaw are both, I believe, courtesy of Stuart. Ashbery, in an interview with John Tranter, in the April 1985 edition of Jacket, a small literary magazine. From A Wave, found in Ashbery: Collected Poems 1956-1987, The Library of America. The title of this post is also from the great poem. Michael Pisaro, on his intentions for a wave and waves, from the Cathnor liner notes.